Katie DeGroot is an old friend who lives in a farmhouse on the picturesque banks of the Hudson River just outside of Fort Edward, NY. Her son Niles was in day care with my boys. Her husband Jon and I used to ski together while the three boys practiced mayhem on more dangerous slopes. Like most artists I know, she has a quiet, obsessive side that drives her to long solitary hours in the studio relentlessly putting shapes and colours on paper or canvas. In this case, the shapes come notionally from nature, those rotted, knobby logs you see off the trail, festooned with things growing upon their morbidity. Strange symmetries. But she takes the logs out of nature and puts them up on a white ground, often in tandem (parallel constructions), with the images running off the page, and the moss, lichens and fungi elaborated in fantastic profusion. It’s funny, but as an artist I hate to even say I use watercolors because it’s the medium so much bad art is made with. It’s what your mother uses to paint with in her art class. I only started using watercolors because I had them and I was waiting for the oil paint to dry on a group of paintings. I have never learned the “correct” way to use them. I think of it as fast drying paint that can give you the most amazing color and translucency. You really only have one chance to make the artwork, the watercolor demands that you work quickly and then walk away. If you push too hard, or second guess your first take on the painting, the result is often an overworked failure. I edit a lot. I have worked from nature for many years. Recently found objects such as sticks and logs have become a starting point for my studio investigation. Where these objects lead me in my artwork has to do with my interests in surrealism and abstraction, as well as my own quirky interpretation of the objects’ personality. Katie DeGroot attended New York University and Illinois State University before living and working as an artist in New York City for nearly twenty years. Katie now resides and works in a studio on her great grandparents farm next to the Hudson River in Fort Edward, NY. Katie has exhibited her artwork regionally and nationally. Currently she is exhibiting work in the 2013 Mohawk-Hudson exhibition at The Hyde Collection in Glens Falls, NY, and the Albany Airport Gallery. This fall she had a solo show at Gallery Gris in Hudson, NY. 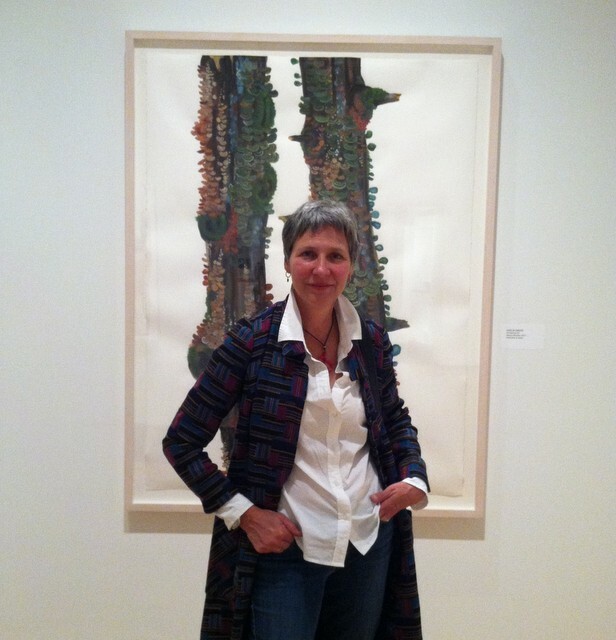 She is currently the Director of the Skidmore College Summer Studio Art Program. These are absolutely gorgeous! I love the colors and tandem forms. Thanks for posting!